Europe's newest robot cargo ship to haul supplies to the International Space Station will be named after the 20th century's greatest scientist: Albert Einstein. The unmanned spacecraft, formally known as an Automated Transfer Vehicle, is currently under construction. When it launches toward the space station in February 2013, it will carry Einstein's name, continuing a tradition that began with the space fleet's first entry, the ATV-1 Jules Verne, in 2008. The Albert Einstein will be ATV-4, the Automated Transfer Vehicle to be launched by ESA. Albert Einstein was born in Germany in 1879. He studied in Switzerland and spent much of his early career there. In 1905, while working as a patent clerk in Bern, he published four papers that fundamentally changed our understanding of the universe. 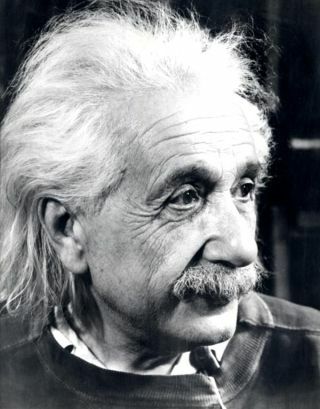 Einstein moved to the United States before World War II, settling at Princeton University. He won the Nobel Prize in 1921 and is generally regarded as the greatest physicist of all time. He died in 1955. Naming a spaceship after Einstein is something of a no-brainer. What's relatively surprising is that it took until ATV-4 to make it happen. The European Space Agency named its previous three cargo ships after French writer Jules Verne, German astronomer Johannes Kepler and Italian physicist Edoardo Amaldi. The huge, unmanned ATVs deliver food, propellant and other supplies to the International Space Station. They generally stay attached to the orbiting lab for about six months, after which time they're loaded full of trash and sent off to burn up in Earth's atmosphere. ATV-2, also known as "Johannes Kepler," arrived at the station in February. About the size of a London double-decker bus, it carried 7.1 tons of supplies. Altogether, the cargo ship weighed about 22 tons at launch. ATV-3 Edoardo Amaldi is slated to launch in February 2012, and ATV-4 Albert Einstein should lift off a year later, European Space Agency officials have said.